Museum of the Bible Curriculum is designed for individual or independent study up to a large classroom setting. The curriculum provides an innovative way for parents/teachers to engage students with the Bible. Also geared for individual learners, the descriptive approach in the four-volume set encompasses major narratives from Genesis to Revelation. Lessons on the history of the Bible help students comprehend the context of the Bible and its fascinating past. Impact lessons introduce the Bible’s considerable influence over the centuries. Using unique interactive technology, engaged students move beyond the page for a meaningful learning experience. History lessons examining historical and archaeological information fostering a better understanding of the Bible and its context. Narrative lessons presenting significant concepts, events, and personalities of the Bible. 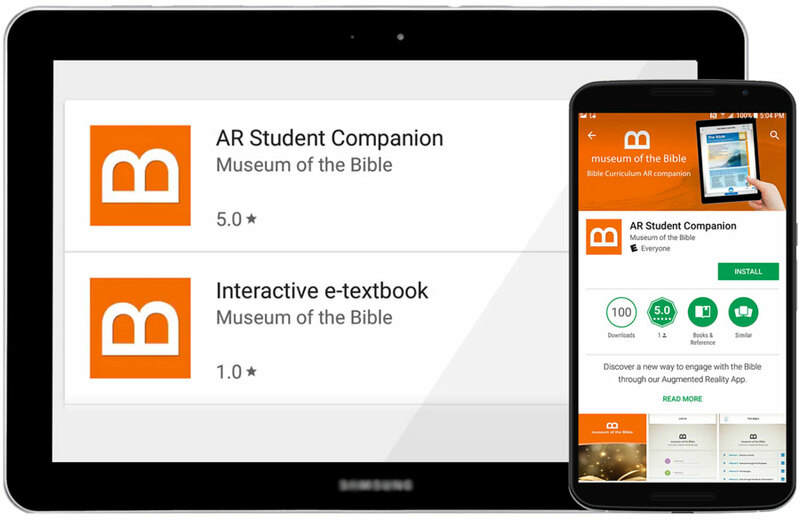 Exclusive digital content is accessible through the student AR (Augmented Reality) Student Companion App which is meant to work in conjunction with each textbook and is included with each Student Edition. This technology engages students with hundreds of media elements including virtual reality, 3D models, animations, interactive maps, gamified quizzes, and more—extending the learning experience beyond the textbook. Augmented Reality (AR) is a live direct or indirect view of a physical, real-world environment where elements are augmented (or supplemented) by computer-generated sensory input such as sound, video, graphics or GPS data. Museum of the Bible’s curriculum uses this cutting-edge technology to bring Bible education to life! See the Gutenberg Printing Press in action, flip through pages of an ancient text or interact with heroes of the Bible! Flexible teaching plans for each chapter include various timed activities. Pedagogical content includes activities for individuals, pairs, and groups. “Goals” and “Essential Questions” highlighted in the Teacher’s Guide assist in understanding and communicating the main ideas of each chapter. Q: How do I know this will work in a school setting? A: Currently, there are over 100,000 students using it in Israel and it has been piloted in several US and UK private schools. Q: Do the volumes go in order? A: Each volume and/or lesson can be taught on its own, but yes, the volumes follow the order presented in the Bible. Q: Will this work without a tablet? A: Yes, but it was designed to be used with the AR (Augmented Reality) Student Companion App;It is included with each Student Edition so the student has a more engaging experience. Q: Can I use a laptop instead of a tablet? A: No, because it requires touch screen ability. Q: What is covered in the Museum of the Bible Curriculum? A: Museum of the Bible's curriculum focuses on the three aspects of studying the Bible. 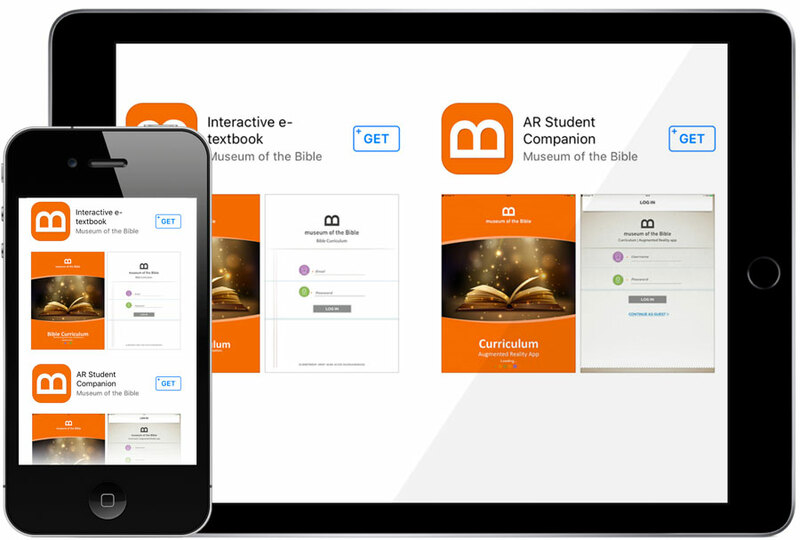 It helps students learn the Bible's content by introducing and exploring its narratives. It helps students understand the history of the Bible by examining artifacts and archaeology of the biblical world and by tracing the history of the Bible's translation and transmission over time. Finally, it helps students explore the impact the Bible has, and continues to have, on the world in literature, art, government, law, and more. Q: Who wrote this curriculum? A: A broad team of academic and educational scholars from the United States, Europe, and Israel have helped write, review, and edit the curriculum. Q: What's unique about this curriculum? A: In addition to covering key biblical concepts and narratives, the curriculum highlights some of the discussion on controversial topics surrounding the Bible. The curriculum focuses on getting students to engage with the biblical texts and the Bible's history and impact in our culture, without teaching a specific doctrine or theology. Q: What Bible translation does the curriculum use? A: The curriculum uses nine different English translations (KJV, NKJV, NRSV, NIV, NLT, NABRE, NET, ESV, and NJPS). For assigned passages not cited in the text, readers may select any version of their choosing. Q: What is in the Teacher's Guide? A: The Teacher's Guide contains flexible teaching plans for each chapter, including various timed activities. This pedagogical content includes activities for individuals, pairs, and groups. 'Goals" and "Essential Questions" are highlighted in the Teacher's Guide to assist in understanding and communicating the main ideas of each chapter. Exclusive teacher resources are available through the UMS Cloud. Q: What is the UMS Cloud? A: The UMS Cloud is an online portal to provide the teacher with additional resources. The UMS Cloud is accessible and included with the purchase of a Teacher's Guide. Supplemental materials include course pre- and post- assessments, handouts, presentations, chapter tests and answer keys, links to additional content, and Bible study resources. Future enhancements include developing sources lists, bibliographies, and a glossary. Q: Do I really need the teacher's guide to teach this curriculum? A: No. However, like other robust curricula, the teacher's guide greatly enhances the teaching and learning experience. Based on insights from the curriculum's authors and reviewers, it helps teachers identify each chapter's themes and central questions. And a major value added is that purchase of the teacher's guide provides access to exclusive pedagogical content in the UMS. This includes handouts and chapter tests. Q: How many chapters should my child complete per week to stay on track? A: The curriculum is designed for the teacher to customize what material the student engages and therefore to help determine the pace. At 45-60 minutes per chapter, students can take up to two academic years to move through all four volumes of Museum of the Bible's curriculum. Each volume is designed to take approximately 40 hours, or one semester, to work through with your student.